Dr. Julieanne Pinel joined the Acorn Animal Hospital staff in July of 2008. A Massachusetts native, she received her undergraduate degree from Saint Anselm College in Manchester, New Hampshire. After working several years in vaccine research for Brigham and Women’s Hospital in Boston, she went on to earn her DVM from Iowa State University in 2002. 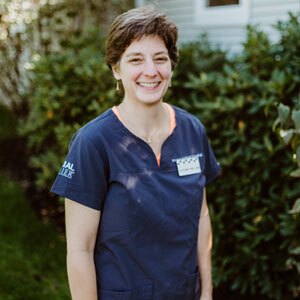 She completed a small animal medicine and surgery internship at Veterinary Specialists of Connecticut, where she stayed on as an associate veterinarian until July of 2008.